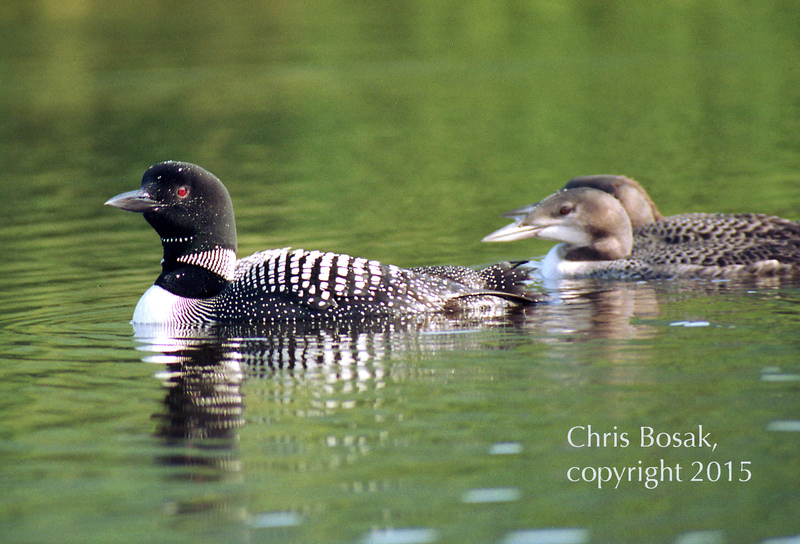 A Common Loon swims on a lake in northern New Hampshire with two young loons. Here’s an oldie, but a goodie for Mother’s Day as this mother loon keeps a watch over her growing babies. Happy Mother’s Day from Birds of New England. Chris. This Wed. 6-7-17 I saw a red tailed hawk eating a mouse in my tree. Great! The next day Thu. I saw a female red tailed hawk eating something in my Live Oak tree again. Another mouse I assumed. Then, a male red tailed hawk chased the femake hawk away & continued to eat what she had been eating. Another mouse I assumed. But then, I saw, feathers fly. It ate another bird. That night one of my mocking birds, that live in a tall bush outside my side door, began singing and didn’t stop all night. This, to me, is conclusive evidence that, the bird that was eaten by the hawk was the female mockingbird that was the males mate & he was singing because he was a bachelor again. It was kinda sad. JTYLTK…Jeff N.Texas. Sorry I meant Wed. 5-31-17 & 6-1-17.